Posted on June 7, 2012 by admin Posted in Android, Android Tips	. To operate Android operating system is actually quite easy, but many people still don’t know how to use or setting the basic operation, such as how to use MP3 as Android ringtone. Therefore, this time we will give you a tutorial how to do that. If you make an adjustment on Settings > Sound Menu, it will affect all application that use ringtone or notifications. However, if you want to choose specific ringtone for specific application, you must enter the application first. For example, if you want to set notification ringtone for incoming SMS, you can do it this way: Open the SMS app (Messaging) > click the MENU button > click Settings > click Ringtone. If you want to use same ringtone as in “Sound” menu, then choose “Default ringtone”. If not, choose other available notifications. To set ringtone for other applications is almost same; you just have to enter the application “Setting” or “Options”. If you want to use the MP3 for notifications (SMS, Facebook, etc. ), put the file on: sdcard/media/audio/notifications. After you put the files on those folders, the MP3 music will be available to choose as a ringtone or notification via the “Sound” menu. Open the Dual File Manager XT, then read the text on the upper left corner screen, it usually: /mnt/sdcard/ or /sdcard/. It means that currently you’re in root folder (not inside any folder) of your SD Card. On the “sdcard” folder, find and click “media” folder. Usually this folder is already exist, but if you can’t find it, then you can create it by pressing the MENU button > Click Create > Click folder > type “media” (without quotes) > click OK. After finish, enter the media folder so the text on upper left screen will be: /mnt/sdcard/media or /sdcard/media. Inside “media” folder, click the “audio” folder, if not exist, create it first > inside “audio” folder, create two folders, first you must create “ringtones” (without quotes) folder and second, create “notifications” folder. After all required folders have been made or already exist, then you can copy the mp3 ringtone or notification file to that folders. But first, you must know where you keep the MP3’s files. For example, if you received files from your friend via Bluetooth, then you can find the files inside the /sdcard/bluetooth folder. From /sdcard/, click the bluetooth folder > give a check mark on the MP3 / music files > press the MENU button > Click Edit > Click Copy (or Move) > press BACK button once, you will be taken back to /sdcard/ folder > click the media folder > click the audio folder > click the ringtones folder > press the MENU button > click Edit > click Paste > Done. Now to activate or set MP3 as a ringtone, you can press the HOME key > press the MENU button > click Settings > click Sound > Click Phone Ringtone. If the MP3 files that you already copied inside “ringtones” folder not show up as a ringtone selection, then you have to reboot your Android phone or tablet (turn off your device then turn it on again). Note: You can use music files beside .mp3 format, for example .m4a, but it depends on your device capability. So, if you already copied the files inside required folders and you already reboot the device yet you can’t find the music files on the ringtone or notifications selection, then it’s probably the file format is not supported by your device. You can use third party application to download and set mp3 ringtones for your Android phone or tablet. As an example, we will use Zedge this time. To use this application is very easy. First, download the app from Google Play Store, then after that you can search for thousands ringtone and notifications that available to download for free! To narrow down your search, you can choose Ringtone Categories such as Blues, Bollywood, Children, Classical, Dance and many more. You can also sort it by newest, featured, most downloads all time, etc. After you finish download the music file, you can set the ringtones directly from the Zedge app, or you can set from the Settings > Sounds menu. 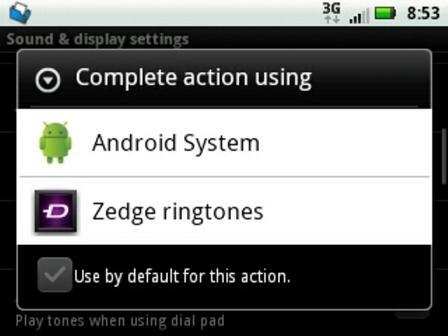 When you click phone ringtone, it will show pop up menu and you can choose to use Android System or Zedge Ringtones as in below picture. Tags: how to set mp3 ringtone in android, how to use mp3 as ringtone on android	.